"Our Common People attempt to avert the danger of chewing by placing under the chins of the dead a portion of recently excavated earth, lest they perhaps open their mouths and chew on the attached bands. Others, who do not consider this a sufficiently safe measure, before the mouth of the dead is closed, also place a stone and a coin in the mouth, so that in the event that it begins to chew within the grave, it would find the stone and coin and would abstain from chewing." 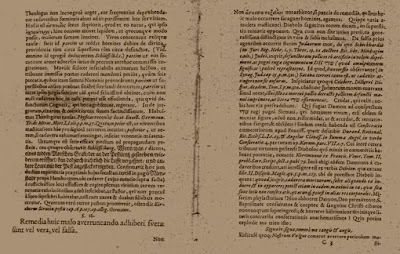 That is an excerpt from an ancient manuscript written in 1679 by Philip Rohr. What this manuscript addresses is the fear of having the dead rise to feast upon the living. Sound familiar? Even 330 years ago we were preparing to combat the undead. 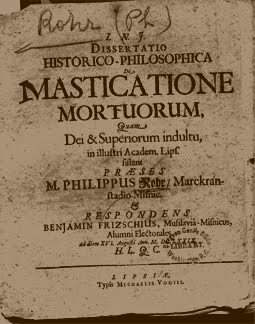 De Masticatione Mortuorum which translates from Latin as "On the Chewing Dead" was recently featured on National Geographic. While they are mostly trying to make comparisons to vampires, you and I both know where the real threat lies.